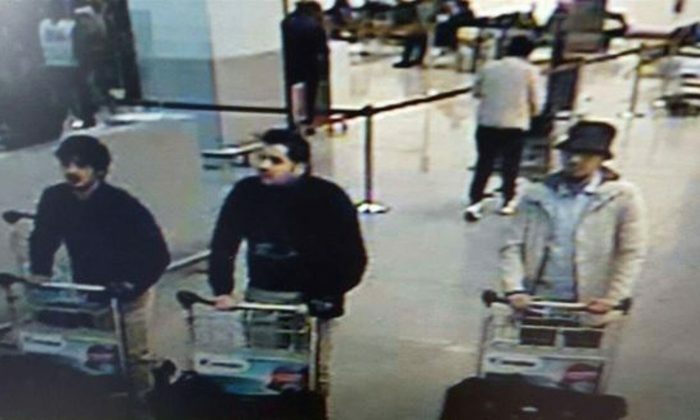 The three deceased suspects of the March 22 Brussels terrorist attacks have been identified, reported The Telegraph, as Najim Laachraoui, Ibrahim El Bakroaoui, and Khalid El Bakroaoui. A fourth yet-unidentified suspect is believed to be on the run. Approximately 270 were injured and 34 were killed in the attacks. Undetonated explosives were found in the luggage left behind by the fugitive suspect. Laachraoui, Ibrahim El Bakroaoui, and the unknown suspect were pictured in photos released by authorities. The three set off the explosives at the Zaventem Airport, while Khalid El Bakroaoui, Ibrahim’s 27-year-old brother, was responsible for an explosion at the Maelbeek metro station that occurred around 73 minutes after the airport attack. The explosives for the November 2015 Paris attacks, notes The Washington Post, are believed to have been prepared by the 24-year-old Laachraoui. Early on at a March 23 press conference, Belgian prosecutor Frederic Van Leeuw said undetonated explosives were found in the luggage left behind by the fugitive suspect. The bag exploded after having been defused by a bomb squad, due to the “instability” of the device, noted Van Leeuw. Five police raids have since been conducted. One occurred based on information authorities received from a taxi driver. Van Leeuw stated that 15 kilos (about 33 lbs) of “ATP” and materials used to construct explosives were also found during the raid. One person was arrested and questioned, but later released by authorities. Van Leeuw said that, at this stage, it is not a good idea to release an abundance of information.